Want a job at Amnesty? 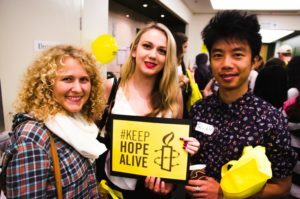 Amnesty International Australia employs around 90 staff across a range of positions, and our employees bring a variety of skills and qualifications from diverse backgrounds. Our employees are dedicated, passionate individuals, united in the belief that together we can campaign for human rights impact and make a difference. Do you share our vision for a world where human rights are celebrated and protected? If you would like to submit your CV for future employment opportunities, then please register your CV via the positions page of our website. For more information about working at Amnesty International Australia please contact our Human Resources team at humanresources@amnesty.org.au. Please note we are only able to maintain your details and CV via our website application process.